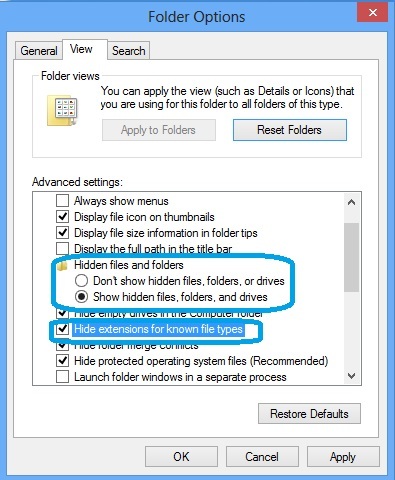 The article will show you how to view all types of hidden files or folder (either system or not) in our Windows Operating system. After completion of the below process not a single file is hidden on your Windows System. You will also get recover from the shortcut virus. It works well on all version of Windows OS after XP SP 2 (Windows XP, Windows Vista, Windows 7, Windows 8, Windows RT). 4. Now “Apply” all the changes and Click on “OK“. Note: After the completion of all the steps you will able to show all the files and folder on your Windows PC. The hidden files and folder are shown as faded. To remove the hidden attribute, Just complete the previous article view all hidden files and folder using Command Prompt. thanks, it has worked perfectly well. IT WORKED! Thanks! You’ve been a great help :-).